I’m knitting another shawl, out of variegated yarn. I realize that these are weird and possibly ugly, and the fact that I spend the majority of my free time and disposable income on crazy colored yarns to knit potentially ugly accessories, is, perhaps, a bad direction for my life. This could, if my life was a novel, or some kind of art project, be kind of tragic, and a metaphor for modern American life or something. Or maybe I just love ugly shawls. I read a few reviews of the Biennial and I have been incredibly skeptical… hearing your opinion confirms that I’ll likely be incredibly pissed off if I decide to see it. I actually have BFA in Studio Art and I had professors who ate BS for breakfast, lunch and dinner. If I had known then that the art world wasn’t going to get any more respectable I would have changed my major to political science. But are your shawls transgressive? You’ll never get anywhere without that. You need to posit some transgressivity, that’s what you need to do. AGREED on the Whitney Biennial. I took a day off from work to treat myself to a museum and lunch and it wasn’t worth it. Well, lunch was. that’s actually quite good you know. 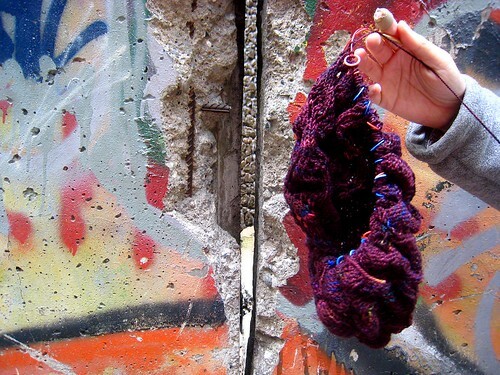 variegated yarn and the randomness of choice and the tie in back to third wave feminism. and there are far more tragic choices women can make in life than knitting shawls. like … oh maybe i don’t need to list them.